An otter is a mammal. You can find various species of otters living on each of the five continents. Otters are considered semi-aquatic, although they can live on land as well. They eat mostly fish and other marine life, in addition to some reptiles, like lizards and snakes. According to Otternet, an informational website dedicated to otters, several of the thirteen otter species are threatened or endangered. Otters rely on their fur, teeth, noise, habitat and ability to flee to escape from predators and survive. Otters live in freshwater rivers, lakes and streams, as well as coastal areas. An otter is very resourceful in its quest for food. It dives deep into the water and relies on its eyesight, hearing and sense of smell to seek out prey. It’s also considered a social animal, with most species enjoying the companionship of fellow otters. Baby otters, called pups, depend on their mother and siblings to care for them until they’re about five months old and begin to care for themselves. Although biologist don’t know the true cause for the decrease in the otter population worldwide, it’s believed overfishing, oil drilling and pollution plays a role. Overfishing forces otters to seek food in deeper waters and even on land, which puts them at risk to predators. Oil drilling and water pollution from pesticides and chemicals released into waters also reduce their food supply. In some parts of the world, the otter is hunted for its fur and widespread poaching has rapidly depleted the otter population. A species of otter is found in nearly every part of the world with the exception of Australia and Antarctica. The otter's diverse habitat serves as a place to live and socialize and provides protection. For example, sea otters live mostly in the kelp beds near the shoreline of Alaska, where they can hide from threats. The marine otter lives among the rocky coastal region of Chili and Peru, where it also finds refuge from predators that are unable to navigate the rocks. Living mostly in the southern part of the African continent, the cape clawless otter makes its den under driftwood, rocks and vegetation--its safe haven from marine predators. Although most freshwater species of otters have few predatory threats, mothers need to keep watch of their pups. Wolves, eagles and large cats, such as pumas and jaguars, prey on young, vulnerable otters. A mother otter, whose pup is in danger, fends off a predator by any means necessary, including putting her own life in jeopardy. Many species of otters, such as the North American river and giant river otter, have strong teeth, which they use to ward off predators. Certain otters, like the giant river otter, make a loud snorting noise when faced with danger to alert other otters. Sea otters, on the other hand, do have known threats. According to Kids Planet, sea otters escape from predators, like killer whales and giant sharks, by hiding in kelp beds, coming up on land or fleeing. 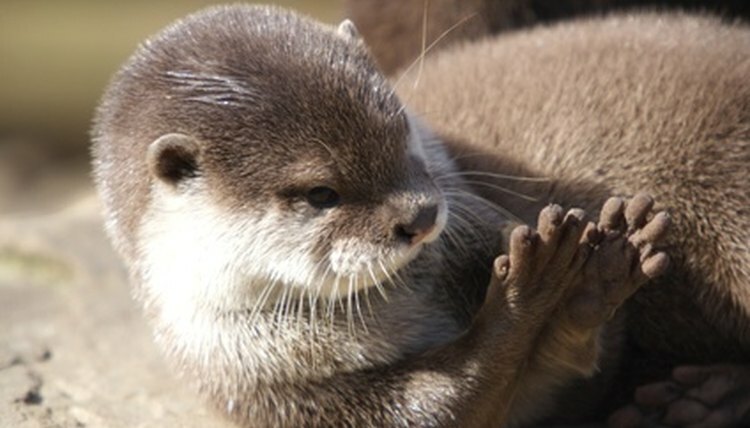 According to Angel Fire, an informational animal website, an otter’s fur is very dense. Constant grooming enables an otter to rid its fur of moisture, so that its skin stays warm and dry. If dirt and debris gets into its fur, the otter can freeze to death when in colder regions, which is why it is so vulnerable when caught in an oil spill.